Following a sold-out residency with Queen at the Park Theater in Las Vegas, Adam now has time to continue to work on his own new music. Rumors are that there will be announcements about some acting roles and let’s hope that there is some firm news about his music. 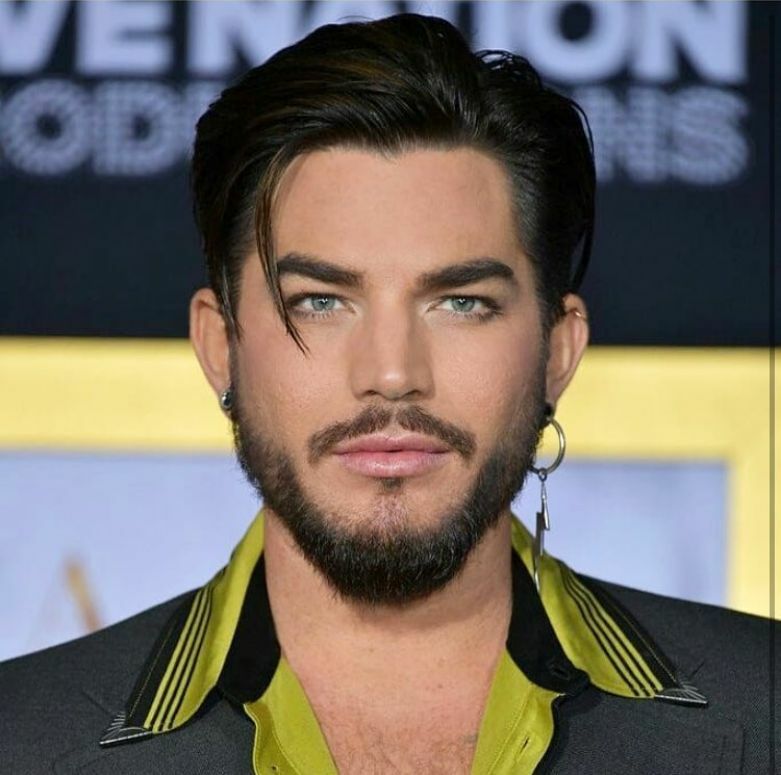 This month’s photo from the “A Star Is Born” premiere taken by Neilson Barnard was posted on Adam’s Instagram. And if you want to stimulate your cerebral senses why not check out the puzzle page for a new jigsaw puzzle (A Star is Born), crossword (Secrets! ), word search (Leaving Las Vegas!) and Adamoku/Sudoku (GLAMBERTS)!! Adam is to kind to put himself in the middle of Brian’s big moment . And Brian inserting Adam in everything just doesn’t seem right. I don’t think they are ignoring him it just doesn’t seem to go together at this moment. But wonder what Brian was down about. This is such a big time for Brian and Roger. Brian and the cast were on the other side of the room. So I think what you said, riskylady “Adam so wonderful that he might steal attention from the fragile memories of FM???? Remind people of HIS amazing performances for the past 7 years? It my opinion I think it’s Adam distancing himself. I asked her how she liked the movie. She said it was “ok”. I think it will have a huge opening weekend but then drop off. Brian and the cast were on the other side of the room. So I think what you said, riskylady "Adam so wonderful that he might steal attention from the fragile memories of FM???? Remind people of HIS amazing performances for the past 7 years? Or is this just Adam himself (too humbly) keeping his distance?" It my opinion I think it's Adam distancing himself. I asked her how she liked the movie. She said it was "ok". I think it will have a huge opening weekend but then drop off. ✧♡ adam is my HAPPINESS!! LOL, luval, that’s pretty hilarious! Reflecting, moody Brian might be really suffering from the reviews, and that’s sad, but I’d keep my distance too after seeing how angry he got on Instagram a few times. Critics can be assholes and wanted a seedy biopic, but fans seem to be loving the movie. I think it’s about THE MUSIC, hence the name Bohemian Rhapsody. Hubby says, IF Bri and Roger had made the movie with all Freddie’s sordid details, then critics AND THE FANS would be crucifying them for defiling his memory. LOL, luval, that’s pretty hilarious! Reflecting, moody Brian might be really suffering from the reviews, and that’s sad, but I’d keep my distance too after seeing how angry he got on Instagram a few times. Critics can be assholes and wanted a seedy biopic, but fans seem to be loving the movie. I think it’s about THE MUSIC, hence the name Bohemian Rhapsody. Hubby says, IF Bri and Roger had made the movie with all Freddie’s sordid details, then critics AND THE FANS would be crucifying them for defiling his memory. #BohemianRhapsody will rock the box office this weekend. Finally a picture of Adam smiling from last night. He was kind of dour in most of the pics. Who knew playing Fiyero took so much dexterity. So great to see @adamlambert at the @bohemianrhapsodymovie after party! VIDEO|@adamlambert on his way to the @heidiklum annual #Halloween party in New York with his friends. instagram.com/p/Bpn9n8cBOHa/ His make up is amazing! if i’d ever saw him somewhere like that i’d probably just sit right there on the street and cry until he’d leave and then i’d realize i could have hugged him but it’s too late and i’d cry even more. NEW PHOTO via charlbrown instagram stories with @adamlambert WOW! Adam is on a table dancing! Hahaha awesome!